In a land without bananas, the village awoke to nine banana crates, each containing the severed head of one of its sons. Along with each head was an I.D. card to identify the victim since some of the faces were completely disfigured, either by torture before the beheading or by something similar after the slaughter. The characteristic features by which they had been known through all the years of their bygone lives were no longer present to distinguish them. As the village awakes to the gruesome discovery, one of the nine heads causes particular distress to Abdullah Kafka (so called for his nihilistic views on life). His best friend Ibrahim is among the casualties, bringing to an end a close relationship spanning decades. At this point, the story takes us back in time to when three youths, Abdullah, Ibrahim and the third member of their band, Tariq (nicknamed ‘the Befuddled’), roamed the village dreaming of a bright future. Tariq, the son of the village’s spiritual leader, takes on his father’s role and manages to become a respected (and wealthy) model citizen, but his friends will not be so lucky. The ensuing decades are to be times of war and hardship, and Ibrahim’s nickname, ‘the Fated’ is to prove unfortunately apt. 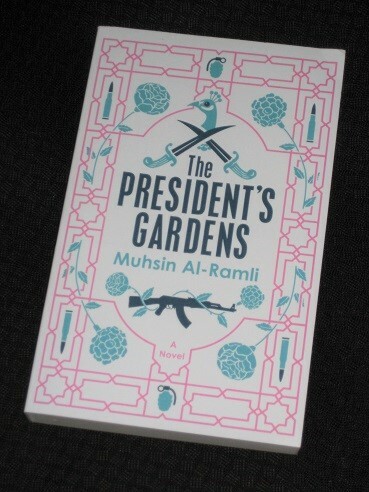 The President’s Gardens is fascinating tale in which the writer introduces a tragic event before taking the reader back in time to see how we got there. It’s a story of the country’s recent history which is told through the experiences of three friends born in 1959, a generation living through turmoil, but it’s also a history lesson for those unfamiliar with these events. Abdullah and Ibrahim are unlucky enough to be conscripted for military service just before the Iran-Iraq war breaks out, and when it seems as if the country (and the friends) are recovering, Saddam’s disastrous decision to invade Kuwait sends Ibrahim back into the war zone. Through Ibrahim’s eyes, we experience life on the front line, or rather carnage in the desert, yet the effects of war aren’t restricted to death and mutilation. The use of chemical weapons in the earlier conflict brings unexpected consequences for one of the group. The twist in the novel comes when Ibrahim needs to move to the city to get better medical attention for his dying wife, with Tariq’s contacts coming up with a well-paid, exclusive position. The catch? The war hero is sworn to secrecy (not that he’d be tempted to open his mouth about his new job). Ibrahim’s first task is to tend to the gardens of the title, catching a terrifying glimpse of the country’s leader in the process. Later, he is given a new position, one that comes with more money and prestige, but involves some even dirtier work. The President’s Garden is an enjoyable read on many levels, and Leafgren has done excellent work in producing a flowing English text with a distinct style, using exaggeration and anecdotes, as well as providing a sense of elegance and tranquility. Al-Ramli teases the reader a little, introducing several ideas in passing, only to leave us in the dark as to the full story. It’s only later, when he circles back to fill in the gaps, that we understand the full significance of, or motives for, certain actions (such as why Ibrahim’s daughter is so keen to find her father’s body). Part of the pleasure of the novel is the picture the writer develops of the main character’s home village. It’s a very different kind of place to that most readers will be used to, with the men tempted to take multiple wives (and often under pressure to marry widows). Everyone knows everyone else (and their business), and when there’s something to celebrate, there’s gallons of tea, but not a drop of alcohol in sight. Yes, there’s a lot of trauma, but some of the best scenes show that life goes on, too. One slight issue I did have with the book was the structure. The President’s Garden’s contains several major strands which, at times, seem to act against each other. The secret of Abdullah’s birth swings between a major development and a minor detail, and when Ibrahim gets his new job, the story almost develops into a new book (and, to be honest, probably could have). Al-Ramli does tie everything together eventually, but (for this reader, at least) it felt a little unbalanced at times. Every victim has a story, and this is Al-Ramli’s attempt to tell just a few of them. Never knew this kind of story before. Have to read it one day.